Anchors are advanced reinforcement device used in integration of passive systems to counteract higher loads. The Anchors transfer tensile load to the ground to take of stresses generated due to loss of effective stress. In Geotechnical engineering it is termed as “Prestressed Post tensioned Grouted Ground Anchors”. The ground anchors can be made by using Wire or cable Anchors / High grade steel Bars. The total length of Bar/ Wire strand is differentiated into free length and Fixed length. Anchor depths could be varied for getting end anchorage high rated capacity drilling rigs are used it can do precise, stabilized drilling, dry as well wet. 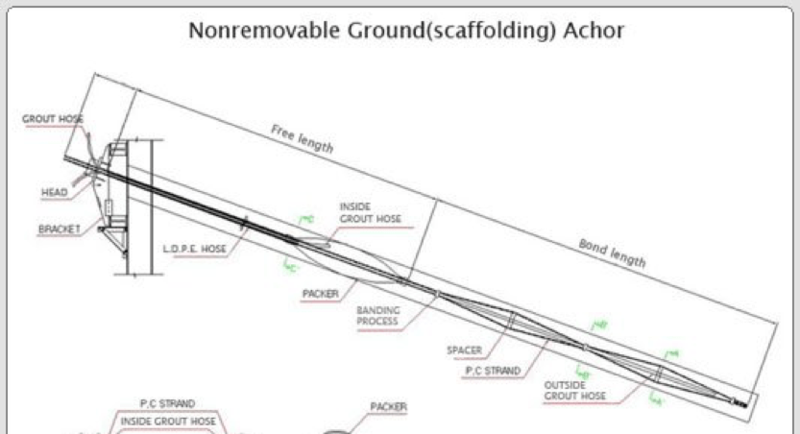 Anchors are classified on the basis of grouting technique, comprising attributes like. The gravity is employed in the fixed length zone & divisible into 4 categories.